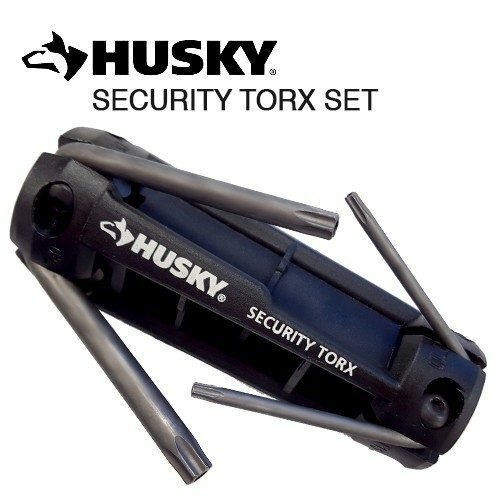 Husky 8-Piece Torx Folding Set Just $3.99! Down From $23! Ships FREE! You are here: Home / Great Deals / Husky 8-Piece Torx Folding Set Just $3.99! Down From $23! Ships FREE! GearXS has this Husky 8-Piece Torx Folding Set for just $3.99 (Reg. $23)! The Husky 8-Piece Security Torx Radial Folding Hex Key Set is designed for tightening and loosening security and regular Torx/star head screws efficiently. The Torx keys are made with hardened steel for durability. The radial handle design easier to use than a traditional foldout and has a 180-degree positive stop for screwdriver-type action.